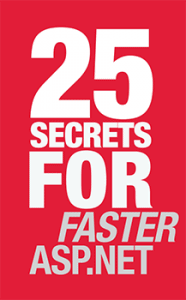 Download your free copy of 25 Secrets for Faster ASP.NET Applications to see the tips and tricks recommended by some of the smartest minds in the ASP.NET community. 25 tips from the ASP.NET community for boosting performance in your web applications. Covers async/await, Web API, ORMs, interactions between your code and your database, and more. As you read the book, why not root out .NET performance problems with ANTS Performance Profiler at the same time?